Suspension for Anti-Obesity Drug Reductil. The European Medicines Agency (EMA) has called for anti-obesity drug Reductil - the brand name for sibutramine - to be made unavailable to patients based on concerns over the side effects it could produce. Appetite suppression medication sibutramine has been linked both to strokes and to heart attacks and, so, should neither be prescribed by GPs nor issued out by pharmacists, the medical body said in a report. Those prescribed this drug are advised to make contact with their GP to discuss other anti-obesity options, but are reassured that ceasing their intake of it in the interim is harmless. 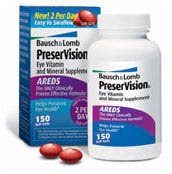 PreserVision® Original formula is the only vitamin and mineral formula proven effective in the National Eye Institute's age-related eye study (AREDS) 10-year trial. Altovis is an herbal supplement, the once-daily tablet to get energized, that its main active ingredients are caffeine and ginseng. Altovis is produced and sold by Berkeley Premium Nutraceuticals, the active ingredients in Altovis were green tea leaf extract (provides caffeine), cordyceps extract (mycelium), Eleutherococcus (Siberian ginseng), vinpocetine (from vocanga tree seeds), and octacosanol. Lybrel is the first oral contraceptive designed to do away with periods. Menstrual periods may soon be just another lifestyle choice for women. When taken daily, the pill can halt women's menstrual periods indefinitely and prevent pregnancies. ABRAXANE 100mg (Paclitaxel) is a cancer (antineoplastic) medication, used in the treatment breast cancer. Abraxane interferes with the growth of cancer cells and slows their growth and spread in the body. Human Papillomavirus (HPV) Types in the vaccine (6, 11, 16, and 18). EraxisTM (anidulafungin) -Pfizer- has been approved by the U.S. Food and Drug Administration to treat candidemia, a potentially life-threatening bloodstream infection. Candidemia is the most deadly of the common hospital-acquired bloodstream infections, with a mortality rate of approximately 40 percent. The FDA has approved a once-daily tablet called Atripla for HIV, a simple regimen that is being hailed as an "extraordinary accomplishment." Each Atripla pill contains 600 mg of Sustiva (efavirenz), 200 mg of Emtriva (emtricitabine), and 300 mg of Viread (tenofovir DF), which are three of the most commonly used anti-HIV medications. EMEND is a powerful medication that, when started before each cycle of chemotherapy, can help prevent the nausea and vomiting caused by chemotherapies that are likely to cause nausea and vomiting. HP-57 is the active principle of a phytochemical compound called Hepacition, obtained through a new extraction process.It is formulated from a combination of Agrimonia, Lepidio and Ortiga Blanca. For treatment of hepatic disorders like Hepatitis A, B, & C, hepatic cirrhosis, and to control and regulate the liver profile levels such as transaminase and billirubin to normal levels. Amevive is available in either intramuscular injection (15-mg alefacept) or intravenous injection (7.5-mg alefacept) formulations. Amevive reduces immune cell counts which could increase the chance of developing infection or malignancy. Avodart, (active ingredient Dutasteride) manufactured by GlaxoSmithKline, is the FIRST & ONLY dual acting 5 alpha reductase inhibitor blocking both Type I and Type II 5-alpha reductase enzymes that convert testosterone to DHT. Ezetrol  (ezetimibe) is indicated in co-administration with a statin as adjunctive therapy to diet for use in patients with primary hypercholesterolemia. Immun'Âge is a food supplement used to enhance the antioxidative defense system. Seasonale is a new type of birth control pill manufactured by Barr Laboratories in Pomona, New York. (Aproved by the FDA but may be available october 2003.) In addition to the contraceptive benefit of the pills currently on the market, Seasonale will reduce the number of yearly menstrual periods from 13 to four, so women menstruate only once each season. Seasonale contains a combination of two hormones commonly used in other oral contraceptives, but in significantly lower doses -- an estrogen (ethinyl estradiol) and a progestin (levonorgestrel). The pills are taken for 84 days rather than the normal 21 days before a woman takes seven days off in order to menstruate. The 30 Day Beauty Secret is a comprehensive herbal/vitamin therapy designed exclusively to help nourish a woman's beauty from the inside out. Pain Relieving Gel In An Aloe Vera Base.